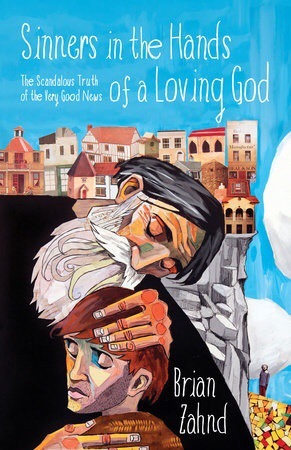 This book cover depicts the scene from the prodigal son coming home to his father and being restored even though the son doesn’t feel he deserves it. This biblical story is of a son who asks for his father’s financial inheritance early. This younger son goes off and lives the glamorous life which ends up backfiring and he ends up eating slops out of a pig trough because he has run out of funds. He decides to go back to his father’s house to be a servant since it would be better than this. When the son returns home his father is thrilled his youngest has returned home. Rather than requiring him to be a servant, the father asks the older brother to get the fatted calf and to prepare a banquet in celebration of his son’s return home safe. The older brother is furious that his younger brother doesn’t get what he deserves for squandering his father’s inheritance. This cover has a modern art look to it. I like the color of blue that was chosen for the sky. In Sinners In The Hands Of A Loving God, the author, Brian Zahnd talks about the topic of Hell and if God is truly monstrous. His journey coming to terms on these matters all began with the similar titled sermon by Jonathan Edwards, “Sinners in the hands of an angry God.” This very old American sermon describes God as a wrathful, angry God whose waiting to torture us for our sins uses different imagery comparison of us to spiders and snakes. Mr. Zahnd was raised to believe in a literal Hell afterlife, the traditional Christian view that only Christians arrive at heaven after they die while the rest burn in torment in Hell. For a time he prayed for God to give him an experience of actual Hell, but none came. Instead God called him to places of disease, war and poverty. Mr. Zahnd saw that life has its own types of Hell in the here and now. What helped the author change his view of who God is? Read his book to find out. It’d worth it. It’s short and precise. I received an ARC of Sinners In The Hands Of A Loving God from Blogging For Books in exchange for my honest review. If you want to read a nontraditional view of God, Hell and ultimately what and who true LOVE is I recommend this book. This book goes on sale 8/15/2017. For further information on the author click here.